Interested candidates who wish to apply based on a waiver must apply directly to Kansas Youth Soccer. Please email Nathan Hunt at nhunt@kasnasyouthsoccer.org to receive your waiver application. Further instructions will be given on how to fill out and complete the waiver process. *Requesting and applying for a waiver DOES NOT guarantee acceptance to the course. Candidates must be approved by US Soccer prior to being accepted to the course*. All candidates must attend both meetings and cannot transfer between different national courses. Check in for meeting one and meeting two will be 10:45am-11:45am. Both course meetings are scheduled to be finished by no later than 12:30 pm on the final day. Candidates have the option to pay in full or enter a payment arrangement. 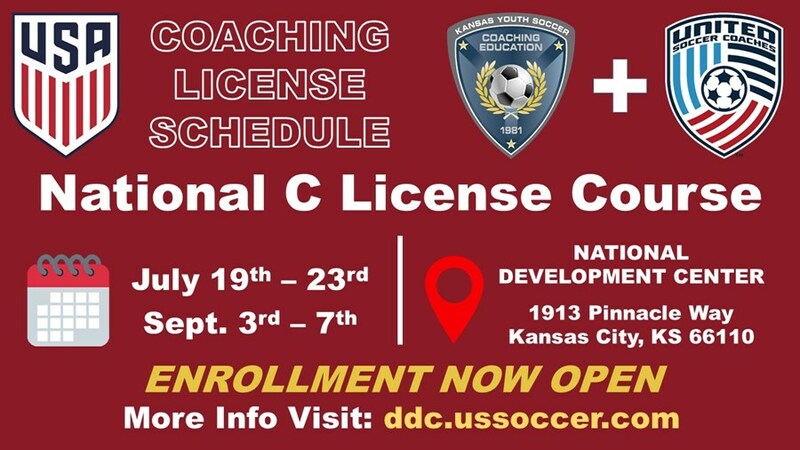 If entering a payment arrangement, you will need to pay the deposit through the DCC AND then contact Nathan Hunt at nhunt@kansasyouthsoccer.org to finish the payment arrangement. Payment arrangements will be an option of 2 or 3 installments; one through the DCC and one or two through GotSoccer registration link provided. A block of rooms have been reserved at the Residence Inn - Kansas City Village West location. This location is minutes from both the classroom and field locations. Please use the following information to call and book accommodations if they are needed.